The cicadas’ shrill rattle disrupts the silence on our stroll thru Turkey Creek’s 130-acre sanctuary in Palm Bay, Florida. 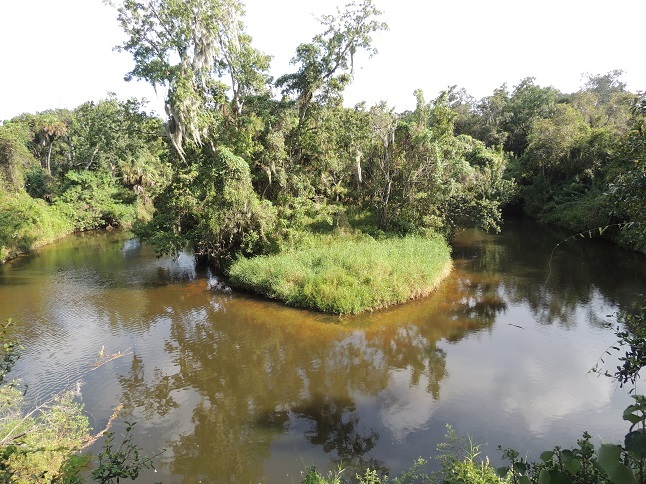 Laurel Oak trees hung heavy with moss loom over the sandy soil along the creek. Palm trees crowd the shore. Sweat pours off me even on this leisurely stroll. The heat is unrelenting, inescapable – even when we’re tucked into a shady spot under a covered bridge. 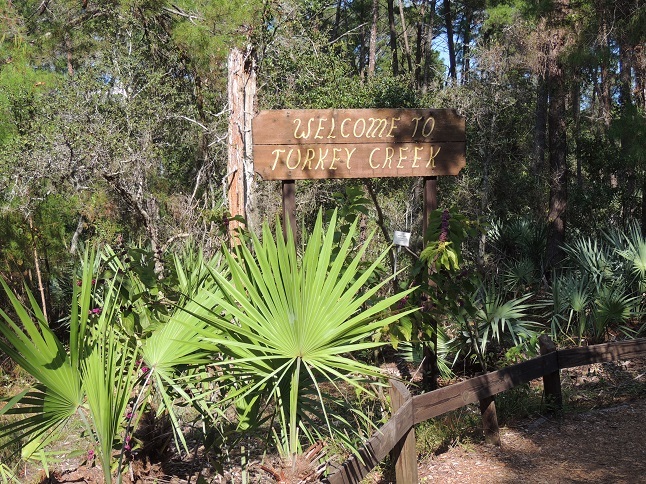 First, we venture to the Creek Overlook Vista which “stands on an ancient sand dune – formed about 11,000 years ago when the sea level was much higher,” according to the Sanctuary’s self-guided nature trail brochure. 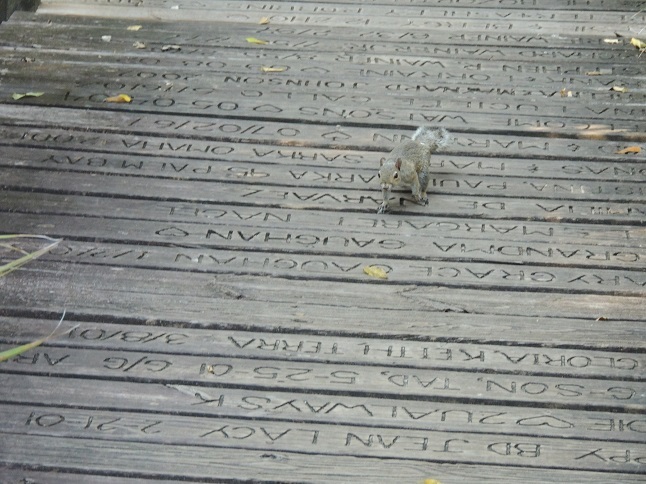 The hike along the nearly 2-mile boardwalk is deceptive. Each time it appears the path has ended, another crook in the trail reveals itself. Sunlight and shadows play tricks in the muddy water. The occasional breeze brings some relief, and I am thankful we brought bottled water. An eerie sound begins, first as a shudder and then builds to a crescendo as it moves thru the hammock. The unexpected noise distracts me from my lonely reverie. I hear a gurgle as if thru a blow hole. About 20 feet from the bridge, a shiny snout tentatively surfaces. A manatee’s head emerges. Then he ducks back into the water. Seconds later, I see his 8-foot-long golden-brown shadow glide quietly just beneath the creek’s surface. I try not to make a sound as I edged along the bridge’s railing. I watch in awe until the manatee is out of sight. 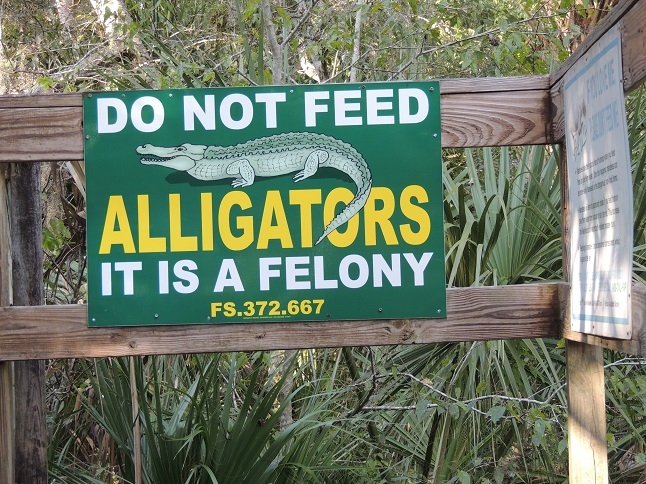 This visit there was no manatee sighting. Disappointing. We saw about a dozen turtles – mostly Florida Cooters – and a Florida Softshell, which has a pointed snout, swim up near the deck and check us out. 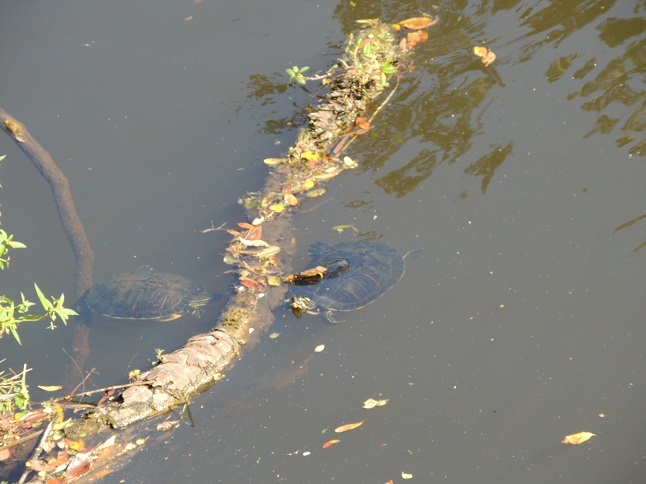 A turtle paddles both his front and back feet before lowering his head and diving underwater. Even a bug’s efforts are fascinating. It struggles mightily against the tide, moving upstream in short spurts. On our way out, we pass a shrub with wild olives among its dark evergreen leaves. 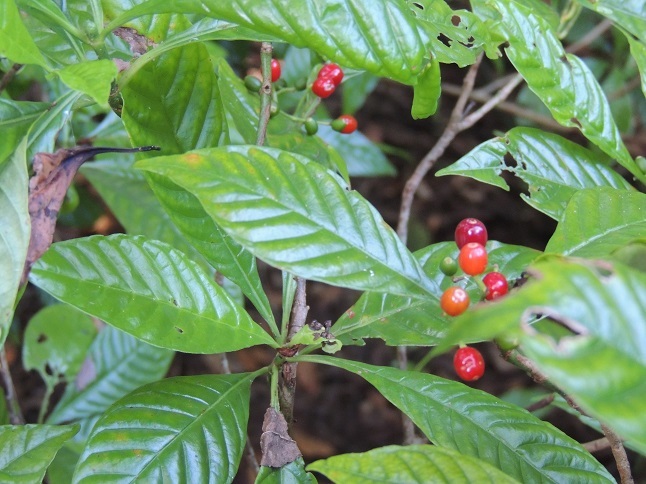 A wild coffee shrub, with glossy leaves, has dark red berries. 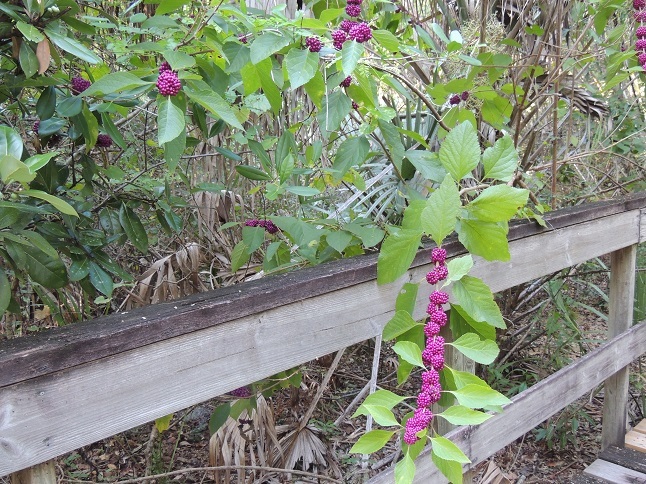 These berries were used by early Florida pioneers to brew a caffeinated drink. We stop at the Gazebo. A couple emerges from the trail with their dogs. One of the dogs carries the bottled water they get to indulge in from their collapsible dog dishes. Then, a car’s shrill alarm pierces the silence. A reminder that civilization is just a short distance away. Wonderful descriptions Mom, I feel like I was there with you! Thank you, Jenn. I think you and Vern would enjoy this beautiful, calming place. It is an excellent way to spend the day. I just wish we had seen a manatee last weekend. It’s just beautiful, Kate, and it’s about 25 miles from our home. When you’re there, it’s easy to shut out distractions and just enjoy what Mother Nature has to offer. Familiar with such. I like the turtles best. It always struck me as unrealistic when they make movies in environments like this without the people slapping at moskeeters all the time. Of course. They’re in the AC like everyone else ! What a totally captivating place to go, Judy! That manatee must have been a beautiful sight. I wish that I had my camera with me when I saw it several years ago, Kate. A week ago, one day after we went to the Sanctuary, I went to another park in hopes of taking photos of manatees there. I waited with camera in hand for about an hour — no luck! Spotting that manatee must have been so exciting. Pity there was no repeat performance. I was disappointed that the manatee was a no-show. But we live close enough that we’ll get plenty of opportunities to see one. Not sure how you cope with heat like that, I know I wouldn’t, I’d be sitting back in the car with the cool air conditioning blowing over me! Is it normally that hot where you live, or more to do with that area of Florida? That Manatee looks kind of sweet – but maybe not. Are they good natured creatures or do you have to be a bit wary of what they might do? And those berries look like a cross between a raspberry and a blackberry with a strange looking colour, very interesting, I’ve not seen them before. I’ve seen people pet the manatees and feed them. Both are against the law. 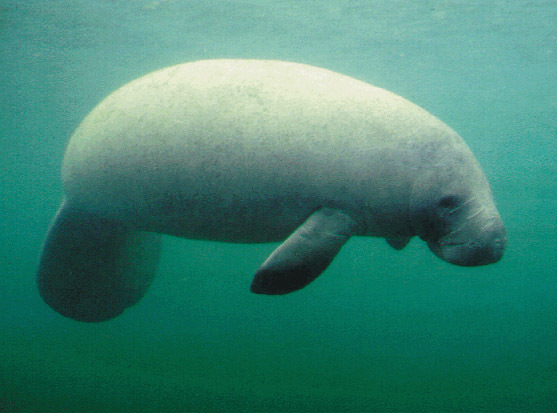 Their nickname is “gentle sea cow” and they do seem sweet. Annie, I enjoy your blog as well. Thanks for following me. I enjoyed the entire stroll with you, Judy, except for the seat-dripping heat (had enough of that here, thank you), but I LOVED the manatee sighting! The only manatees I’ve ever seen were in captivity, but even seen through a glass wall, they’re fascinating. We would have been delighted to have your company, Marilyn. It is a beautiful spot. I wish we’d seen a manatee this time, but I’m happy I have seen some in the wild. They are so cool! Beautifully written, Judy. I felt iike I had a mini vacation when I was done reading. Lovely post, Judy, wonderful photos. Just delightful– many thanks!! Sheesh! Now, you’ll have the state Tourist gurus hunting for me cuz I chased you away from the Sunshine State. While I appreciate your heady praise, Mark, I really cannot capture – in words – just how wonderful this place is. Glad you liked the photos – and the line about the bug. I didn’t want to trade places with him/her, but I did marvel at nature’s creatures. You had me at the edge of my sit with the exciting manatee encounter. I wanted to do a kayak manatee adventure in Florida last Summer but my wife was too scared. may be next year. Great, fun post. Thanks. That sounds like an exciting adventure, IT. But I’m with your wife. My swimming skills are minimal and I’d be afraid that a run “into” the wild might result in a spill into the water. I’m glad you enjoyed my story. Some wonderful sights and sounds! I have to teach my dog that water bottle carrying trick! Glad you enjoyed this, Lisa. It is a beautiful place. We were quite impressed with the doggies and especially the one toting the water bottle. Cool! Always a fun adventure to share your stories my friend. Have a great weekend! Thank you, IT. I’ve enjoyed your adventures this summer as well. Hope you and your family have a wonderful weekend.